Horse cavalry gave way mechanized warfare, and tank armies are giving way to drone warfare. Drones flourish where national sovereignty is weak and international borders are extremely permeable. Since it’s not a good idea for Washington to set precedents it does not want others to follow, greater care relating to US drone strikes is warranted. Two studies on this subject were released last week. Their recommendations clarify the value of trying to devise international standards on the use of drone warfare and the difficulty of doing so. The actions of the United States would serve as a benchmark against which others are judged, and therefore provide legitimacy for and reduce the political and diplomatic costs of other countries emulating U.S. practices. Conducting a rigorous strategic review and cost-benefit analysis of the role of lethal drones in targeted counterterrorism strikes. Improving transparency through the release of a detailed report from the administration explaining the legal basis for US conduct of targeted killings; the approximate number, location and organizational affiliations of those killed by drone strikes; the identities of civilians killed as well as the number of strikes carried out by the military versus the CIA. Transferring general responsibility for carrying out lethal drone strikes from the Central Intelligence Agency to the military. Developing robust oversight and accountability mechanisms, including an independent commission to review drone policy and past strikes. Fostering the development of appropriate international norms for the use of lethal force outside traditional battlefields. Assessing drone-related technological developments and likely future trends and creating an interagency research and development strategy. Reviewing and reforming drone-related export control rules and Federal Aviation Administration rules. It’s easy to fulminate about drone strikes, and hard to stop them when U.S. policy makers don’t have diplomatic and economic leverage and when other military options appear even worse. The fundamental policy question — whether drone strikes do more good than harm – has been answered affirmatively by Presidents as dissimilar as George W. Bush and Barack Obama. Their cost/benefit calculus is cloudy, since those targeted in the field are replaceable and since the efficacy of targeted killing in disrupting plots can’t be quantified. Washington can, however, count dead bodies and can measure the length of time between attacks by terrorists on the U.S. homeland. Also quantifiable, as much as possible through the limits of public opinion polling in weak states wracked by domestic violence, is a direct correlation between U.S. drone strikes and U.S. unpopularity. I follow this issue mostly through the lens of Pakistan, where a standard defense mechanism is to blame outsiders – now led by the United States – for the ills affecting the state. The Obama administration suspended drone strikes while Prime Minister Nawaz Sharif sought to forge a domestic consensus on military action by first talking to representatives of the Pakistani Taliban. This pause had the practical effect of nullifying the domestic argument that Washington was to blame for explosions regularly carried out by one or another group affiliated with the TTP. Drone strikes have resumed after attacks on Karachi’s international airport, alongside the long-delayed, intensified military activity by Pakistan’s armed forces in North Waziristan. The first strike after this hiatus, on June 11, was reportedly against Uzbek fighters linked in unspecified ways to the airport attacks. It elicited the standard public demarche by Foreign Ministry spokespersons about the violation of Pakistan’s sovereignty. Any goodwill with the Pakistani military for targeting Uzbek fighters may have been negated the very next day by a drone strike reportedly against members of the Haqqani network, which has notably been unaffected by this military campaign. 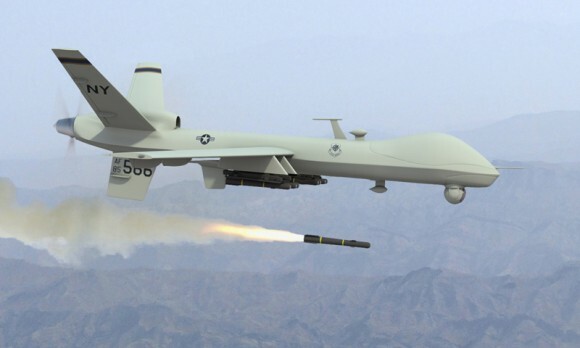 More drone strikes are in store as more countries acquire armed drones. Pakistan seeks this capability and China, worried about violent Uyghur extremists that use Pakistan for training purposes, may well oblige. The current military offensive, like previous ones, was preceded with long forewarning, allowing noncombatants and militants alike to get out of harm’s way. Rawalpindi will now have to deal with safe havens for extremists across the Durand Line, a problem with which the Pentagon is quite familiar. Looking not too far into the future, both states might conduct drone strikes on Afghan territory. This stunning suggestion seems unlikely to be acted upon. It would take a great deal of a political courage on Nawaz Sharif’s part and, besides, U.S. and Pakistani target lists diverge. Still, there is enough of an overlap of national interests to cooperate tacitly, at least some of the time. But how are they any different to a ‘normal’ manned air platform conducting an air strike? I can’t imagine the public uproar being any different if unarmed surveillance UAVs were flying over Pakistan and Yemen and provided targeting data to a manned platform (possibly even a ground launched system such as guided MLRS etc.). What difference does it make if a modified T-6 Texan turbopop trainer, a USMC KC-130 ‘Harvest Hawk’, a AH-64 Apache helicopter, or a MQ-9 Repear fire the same AGM-114 Hellfire missile? Last I checked the physical damage(depending on the warhead variant used, of course)is the same. Overlooking such facts is the result of looking at UAV use as a moral question. That is fine provided that the efficacy and morality of *air strikes* (of any sort) in counter-terrorism/counter-insurgency. In effect that is a question about the utlity and morality of the use of force – a very different question than whether UAVs/artillery/mortars/anything else be used in warfare, or how they should be used (there are only so many ways you can drop a munition of an aerodynamic platform). The “objection” to drones may be a visceral reaction to the “unfairness” of being shot by someone who cannot be shot in return. World War I fighters could fairly shoot each other with bullets, but how dare they gas us in droves? Or in the U.S. civil war, the reaction to snipers sitting unseen in trees and shooting people hundreds of yards away. How brave or manly is that? There is also the political aspect – blaming Americans for deaths of terrorists in Pakistan. Are the American and Pakistani governments coordinating on this, or are the Americans acting independently? No one can say for sure – and it is easy to cast aspersions on those high-tech Americans who sit at a video terminal half a world away and shoot invisibly and invincibly from the sky. Ground and Air Drones are going to take over the entire battle field. No more people needed — inefficient and costly. That is the future. In a world where computers are king, robots do the fighting. People who worry about drones are running while watching their feet. We live in a world where a sufficiently advanced power can assassinate anyone, anywhere, extremely efficiently. What passes for moral debates is just us getting used to that fact. What happens when algorithms predict who is capable of mass murder, and murders them first? The platform, and whether it has a pilot, is irrelevant. Can we fly into the airspace of arbitrary nations and kill whoever we want? We can. Under what circumstances should we? Too boring to talk about. Let’s talk about drones. Sorry, without good intelligence on what somebody is planning, there is no good algorithm that predicts terrorist acts. The smartest, fastest, best-programmed computer cannot adequately distinguish terrorist from non-terrorist using only information available from the sky. Summary execution from the sky (without trial) is not acceptable for domestic law enforcement, and may not be acceptable by the lowered standards for war time killing. For the latter, information from the sky needs a heavy supplement from reliable ground-based intelligence. A future with robots fighting robots may sound benign, but unless the laws of war change considerably, the robots will be killing people too. If that future is not desired, what feasible bans or regulations can there be? Did these report study how does law of armed conflict and international humanitarian law applies on drone strikes in a foreign country. Especially the signature strike and the double tap( killing first responders) . And what actions would constitute war crimes in the context of use of drones. Washington-based Institute for Science and International Security suggests that India appeared to have followed through on its publicly announced intention to build the SMEF and started constructing a large enrichment centrifuge complex near Chitradurga, Karnataka. Karnataka appeared to be a site of hectic activity for India’s covert uranium enrichment programme as well as a secret testing ground for armed drones, according to satellite photographs and other evidence compiled by a U.S. think-tank. I thought the whole point of the drone strikes, which the Pakistani Army can put an end to any time it wants, is that they conveniently result in the death of people who are troublesome to Pakistani authorities but popular among certain segments of the Pakistani population. Hard to see how openly acknowledging the coordination that has been going along from the start, would improve relations between any of the (more than two) parties in this conflict. Some of the targets of US drone strikes “are troublesome to Pakistani authorities,” others may be in collusion with them. When US-Pakistan relations are bad for other reasons, drone strikes make them worse, regardless of the target. When US-Pakistan relations are on the upswing, and when the targets have turned against the state, there’s a lot less hue and cry about drone strikes in the Pakistani media. According to a recent Pew survey, about two-thirds of the Pakistanis polled are not sympathetic to the Pakistani Taliban. About three-quarters view the United States as an enemy. Drone strikes are one reason for the second percentage; media manipulation by Rawalpindi is another. Open acknowledgement of cooperation regarding drone strikes could increase the first percentage and dramatically lower the second. But I don’t see this as likely: just as we have difficulties with the notion of differentiating between good jihadis and bad jihadis, authorities in Pakistan have difficulties differentiating between good drone strikes and bad drone strikes on their soil. I think John’s point is that the Pakistani military – their quite capable air defense and air force arms – could start shooting down the not really very stealthy or covert drones at any time they chose to do so. That they have not indicates a practical, if not politic, agreement exists. It is in the Pakistani government and military’s advantage to not make whatever agreement it is public, or they would have done so. It’s been said that were it openly talked about, there would be riots in the streets of Islamabad, but everyone’s ok to see it as “a violation” and leave it at that. It’s a curious method of saving face by allowing a face-insulting activity to continue. I would prefer if all drone activity were more overt; the secret war nature of what we’ve gotten in to with drones is not conducive to straightforwards moral discussions with the rest of the world. The level of secrecy that manned special operations need and needed to work is one thing, but drones are the epitome of “safe” ops for the US troops etc. However, what we got into with Pakistan, where their military and politicians are in a dance with their own internal political situation that’s nigh-on insane, is what it is. They need to not have their populace rise up in a unified mob to overthrow the elected government and military structure. It’s important for any number of reasons, not least of which include the civilized aspects of the country and its nuclear weapons program and materials. Plenty enough of the populace are anti-government and anti-west for a mass uprising to be disaster for the government and civilization there, even if the government won the resultant civil war. What George said. At some level, there is – even when relations are otherwise bad – a deal between the US and Pakistani authorities saying that they both want US drones to be killing Taliban-ish militants in certain areas and that the Pakistani government wants to make press releases saying that this is all the Evil American’s fault. Where the Pakistani authorities are concerned, this is a win-win-win situation. The two-thirds of Pakistanis who think the Taliban are the bad guys, get to see the bad guys being killed. The one-third of Pakistanis who see the Taliban as the good guys, hear the Pakistani authorities denouncing their deaths. The Pakistani army and government maintain good relations with the United States government. And everybody gets a nice, safely distant, foreign enemy to hate. For the United States, it would be nice if we could have all of that and the friendship of the Pakistani people. But, insofar as it is the Pakistani authorities who are going to be doing 90% of the work of preventing angry Pakistanis from organizing international terrorist conspiracies, I suspect the friendship of a strong Pakistani civil and/or military government will count for more. And if what we are doing threatens our friendship with the Pakistani authorities, or seriously threatens their power at home, I expect them to back up their rhetoric by shooting down a few drones. That’s the cheap, effective way for them to signal that they really want things to change in this arena. There’s another practical consideration: shooting down US drones would also mean shooting down US military and economic assistance, as well as Coalition Support Funding. Pakistan’s diplomacy has relied on the support of two major powers — the United States and China — to counter-balance India. Pulling this off has been an extraordinary diplomatic accomplishment, when you think about it. Shooting down US drones would be a different matter than colluding with the targets of some drone strikes. It would likely have a profound impact on US-Pakistan relations. Kind of doubtful all American aid would cease, if Pakistan provided adequate warning and a clear statement of opposition. I doubt it would work that way. A declaration of this sort would have the same practical effects I mentioned in an earlier reply… and it could be challenged. There is a moral dilemma attached with the use of drones the way these are used. The drone operators cannot even name ten percent of the people they killed. It is so analytical and based on meta data . Arming Pakistan with this capability is an option. So that it’s their people., their drone and their finger on the trigger. No drama of foreign intervention. And if Pindi did not manipulate the media then would the US be automatically a popular or a less hated country ?? The soldiers who stormed the beaches at Normandy could not name even one percent of the people they killed. Was this a shocking moral dilemma they had to face? Also, when drone operators do know the names of the people they kill, we are told that they are being extra specially evil because they are engaged in assassination, not war. So you might want to get together with the other critics and get your story straight. The inability to name the people being killed is not a unique moral dilemma associated with drone warfare. It is the normal state of affairs in all warfare. That drone warfare occasionally, as much as a few whole percent of the time, allows us to know the names of the people we are killing, suggests that it allows a vastly greater degree of discrimination than in the usual forms of warfare. Fewer dead innocent bystanders, fewer dead only-weakly-guilty foot soldiers, fewer deaths generally for the same overall effect. I don’t see any moral dilemma in that at all. The Stimson report mentions critics who worry about “remote-control killing.” The report notes, “UAVs permit killing from a safe distance — but so do cruise missiles and snipers’ guns.” Is this comparison adequate to justify armed drones? What neither report advocates or considers is, why not simply ban armed drones? Just as we have banned poison gas, land mines, germ warfare, and (maybe someday) nuclear war, we could choose to ban these remote-controlled killing machines. Although the current breed of armed drone is not autonomous, they are in many respects like “killer robots.” The continued use and acceptance of armed drones could lead to the development and deployment of autonomous killer robots. You think too small: why not ban warfare altogether? Which, of course, we already did. It didn’t work. And I’ll also note that “we” didn’t actually ban land mines; I am pretty sure that most of the posters here are from countries that didn’t sign that treaty, do keep plenty of land mines, and intend to use them in any future war of the sort where land mines are particularly useful. The arms control agreements that actually work, are the ones which mitigate the harm caused by war without changing the outcome. Chemical warfare, at least WWI-style, was brutal but symmetric – it merely prolonged the fighting and increased the cost. Easy for everyone to agree with abolishing it. Arms control agreements that fundamentally change the balance of power in a major area of conflict, almost never work. If a treaty is signed, it is with the expectation of massive cheating. And drone warfare, fundamentally tilts the balance of power in government vs. insurgent conflicts, firmly towards government. Oh, and it does so while reducing the number of politically inconvenient civilian casualties. Good luck getting the governments of the world to agree to give up that advantage. You could get the governments of Western Europe to agree to it, probably, because they don’t fight insurgents in any big way. They have the United States to do that for them, if it comes to that, and they mostly don’t care how much it costs the US to do it. The brave men who landed at Normandy faced incoming fire from uniformed Germans within visible distance. They were no sitting somewhere in the US with a joy stick in hand and watching computer screen showing bearded males in civilian clothes who have carried weapons since ever due to tribal traditions. Those brave men who landed at Normandy were also in uniform, and operating within a well-defined chain-of-command. So if they committed an atrocity then the legal liability under International Humanitarian Law is pretty clear-cut, let the war crimes commission meet, and let the arguments about “command responsibility” begin. Compare and contrast with a CIA jockey sitting in a control room in Langley, who is launching a Maverick missile at…. something…. somewhere…. That dude isn’t in uniform. Heck, he isn’t even a military man at all, let alone one who is operating within a well-defined military chain-of-command. The CIA, for all of its cloak ‘n’ daggering, is a civilian agency of the US Government. That is axiomatic, because there are five Armed Forces of the USA and not one of ’em is called the “Central Intelligence Agency”. So what the heck is that CIA dude doing with his finger on that trigger? The Center for Strategic & International Studies (CSIS) think tank released a report external link [PDF] offering options for an affordable US military by 2021 that would reconcile cost constraints with providing necessary military capabilities. —-What kind of nuclear arsenal do the authors want to exist in 2021? OAK RIDGE — A stone bungalow that played a key role in the Manhattan Project during the early days of Oak Ridge was gutted by a fire of unknown origin early Monday. The project to build the six SSNs (nuclear-powered attack submarines, usually without nuclear-tipped missiles), in turn, is to be undertaken at the secretive ship-building centre (SBC) at Vizag. India’s first three SSBNs (nuclear-powered submarines with nuclear ballistic missiles) are already being built at the SBC to complete the country’s nuclear weapons triad – the capability to fire nukes from land, air and underwater. The expertise gained in the construction of the SSBNs will help the SSN p ..